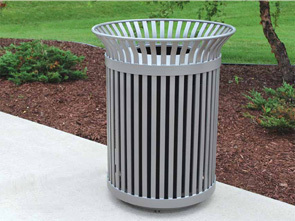 These steel slat trash receptacles are the essential combination of an everyday durable functionality with an aesthetically appealing sleek design. 100% steel and all welded construction, components include 1" x 3/8" vertical slats, strapped by 2" x 1/4" and capped with a 5/8" diameter bar ring. With 32, 36, 38 and 42 gallon capacities available all receptacles come with a rigid poly plastic liner. Models also come available with an ergonomic side entry door and optional keyed door lock. Optional in-ground and surface pedestal mounts are also available. These powder-coated steel 'Steel Slat' trash receptacles are available with several versatile options designed to suit your needs. To make your ordering process simple please follow the easy 3 or 4 step ordering process. Select Model (A, B, C or D) and Choose receptacle color. Select Model (E, F, G, H, I or J) and Choose lid color. (K) Enter the Quantity of the complete trash can(s) you would like to order. Select Model (L, M, N or O) and Choose receptacle color. Select Model (Q, R, S, T, U or V) and Choose lid color. (W) Enter the Quantity of the complete trash can(s) you would like to order.